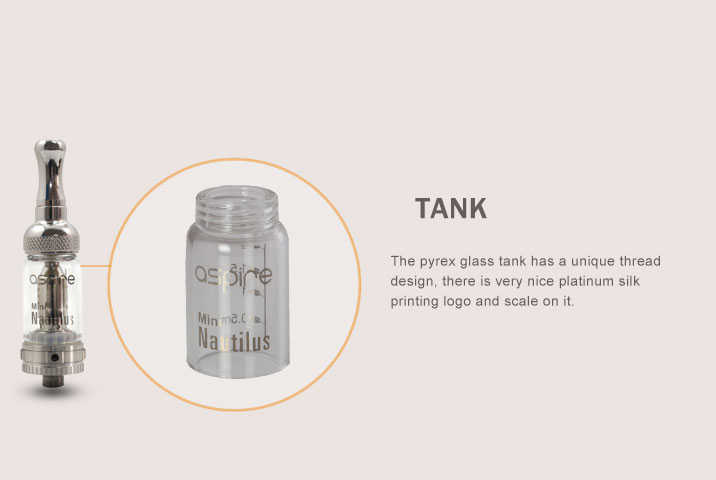 The Aspire Nautilus MINI BVC Glassomiser is the next generation of tank systems. Made of stainless steel and Pyrex glass, the Nautilus Mini uses the Aspire “BVC” (Bottom Vertical Coil) atomizer technology. This new technology is designed to last longer while still giving users the purest and cleanest taste from e-liquids. The Aspire Nautilus MINI BVC Glassomiser includes an improved four-port adjustable airflow system that is both user friendly and reliable. This unique four-port system allows the user to adjust the draw, warmth of vapor, and amount of vapor produced. The Aspire Nautilus MINI BVC Glassomiser design also makes it easy to carry, install, and refill. The Nautilus MINI by Aspire has taken the clearomiser world by storm over the past month and it is here NOW at eCig world Australia. The Aspire Nautilus MINI BVC Glassomiser has an exclusive adjustable airflow design that is revolutionary. With a simple turn of the lower ring, you have four options to adjust airflow to meet different requirements for vaping. With the option of different size air-ports, it allows the user to produce big clouds of vapor, with a pure and clean taste. With the Nautilus four-port system, you can now adjust how hard or soft the drag is, how warm or cold the vapor is, and how much vapor is produced. The Nautilus is also very easy to install and refill. Oh, and the most important thing of all, it allows you to adjust your tank to accomodate for different eliquids! Aspire...the trusted name in Personal Vaporizers. Brought to you by Anyvape. Note: The Aspire Nautilus MINI Bottom Vertical Coil (BVC) heads will only work with its own designed version. 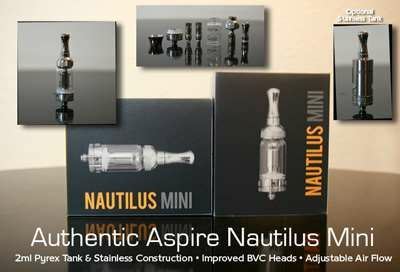 The standard Aspire Nautilus BDC coil heads are not compatible. To fill, turn the Aspire Nautilus MINI BVC Glassomiser upside down and remove the threaded end cap. Fill the outer portion of the tank (avoid getting e-liquid into the center airflow tube) and then screw the end cap back onto the tank tightly. You can now turn it rightside up and check for leaks before using. The head and wick assembly will sometimes loosen itself when the threaed end cap is unscrewed. Always check that it is pushed into the bottom cap tightly tightly before screwing the cap back on. Not doing so could result in a leaking or non-working device.